Villa – a country house, designed, mainly in classical Roman, Italian, Mediterranean styles. Such an object is intended for seasonal living, but it is possible that the villa will play the role of a full-fledged home. Villa in Ancient Rome was a symbol of high social status and the relationship of man to the nobility. Today, it is increasingly possible to notice such a format of housing outside the city limits, so the villa is gaining a lot of popularity among connoisseurs of true luxury and tranquility. If you are striving to create a picturesque “family nest” with a landscaped area, landscaping, the services of professional builders and decorators will help you. We suggest you familiarize yourself with the section – the cost of works on the installation of the facade decoration. Presence of the land with the presence of landscape art. Green plantations in the form of planted flower beds, neatly cropped bushes. The villa in the Roman style has two or three floors. The roof of the building is tiled or imitated. At the entrance to the house, along the facade and on the balcony there are columns, arthuriums. Mandatory availability of a terrace, small pond or swimming pool. Outdoor decor for the house is made in light, pastel colors: white, cream, coffee, sand, celestial, cream-lemon, turquoise. Polyfoam – a universal material, through which it is possible to perform the warming of walls and the creation of decorative elements. Columns, balusters, rustic, pediment, molding, cornice, consal, bas-relief and much more will be successfully looked at the Roman villa. We suggest that you get acquainted with the photo collection of our designers – the decor of the facade from the foam plastic photo. Creative ideas will allow you to choose the optimal concept for the villa of your dreams. The cost of installing the facade decoration depends on the complexity of the work, the quantity and quality of the materials. We ask you to clarify with our managers the actual cost of works. Permanent and large customers are given a discount. We execute orders of any complexity on an individual project or we will select author’s solutions for you. Facing the front of a Roman villa necessarily includes many architectural elements. 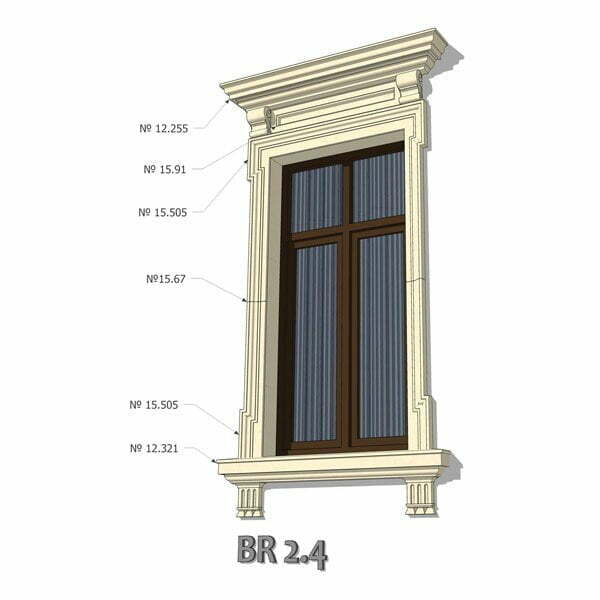 Columns play a primary role in supporting the balcony, hinged thresholds, as well as to give the exterior a complete look. At the entrance to the house there is a ladder with patterned handrails. Rustic is used to distinguish sections of the facade. It is densely located to each other masonry with rough texture. With the help of rustic the exterior of the building acquires massiveness and stability. Still have questions? Get a free consultation with the managers of our center.